As professional home stagers, we work with lots of real estate agents with different approaches and strategies on real estate marketing. Home selling has changed dramatically over the past 10 years due to the internet and home buyers expectations. While the real estate market should remain strong in Oregon, statistics prove that well prepared and strategically marketed homes will demand the best sales price. Here’s a link to a great article that summarizes our position on marketing a home well — couldn’t have said it better! A professional real estate agent is important (and we can recommend many). We also have long term relationships with great painters, handymen, housekeepers, landscapers that will quickly respond to our clients’ needs. 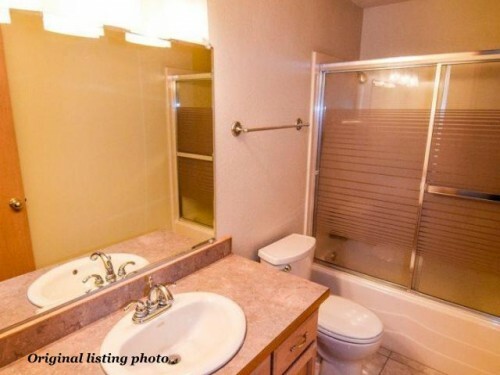 One thing we’ve left up to the listing agents in the past is listing photos. One scenario we see frequently (that doesn’t work) is when we stage a property, and the listing photos are not done by a professional. Yes, some agents take good photos, but I can think of only a handful (amongst the hundreds of agents in the area) who take photos that are good enough to market a valuable asset! With 95% of home buyers looking online first at homes, this marketing strategy can’t be underrated. Bottom line – a professional real estate photographer is an essential member of the home selling team. This bathroom photo is better than many we see online but still doesn’t capture the feel of this small space well. Better angles, color, and ambiance with professional photography! Photography is so key to home selling success that if an agent doesn’t include professional listing photos in their services, we will arrange for professional photos as part of the staging package. More than once we’ve staged a beautiful home and when looking at it online been disappointed that the photos don’t represent the home well. We appreciate being part of hundreds of successful home sales in 2017. With our vast staging inventory, experienced professional stagers, great home improvement resources AND professional photography, we know 2018 will even be better! 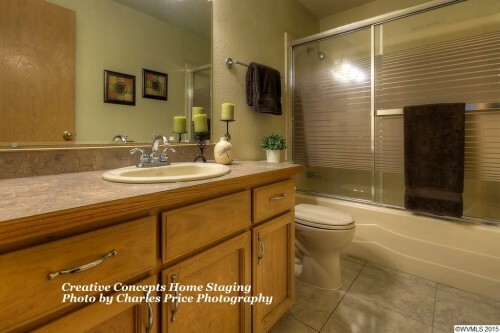 Professional Home Staging – Reliable Contractor Repairs – Beautiful Results!